Los Angeles, California - Since 1986 the Friends of the Los Angeles River has helped protect and restore the river’s historic heritage and riparian habitat. 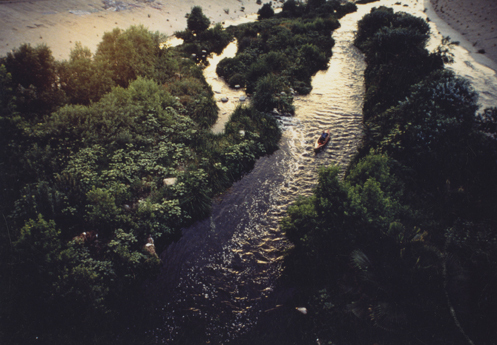 And now that the UCLA Library has acquired FoLAR’s complete administrative records, the story of the organization’s role in the river’s rebirth can be found here. In response to a series of devastating floods, the Army Corps of Engineers turned the most of the river’s length into a concrete-lined flood control channel beginning in the 1930s. Among FoLAR’s programs to connect people to the river are “La Gran Limpieza,” an annual river clean-up held each spring, and an ongoing series of conferences and planning workshops. Its accomplishments include the transformation of two former railroad yards into state parks and the development of a bike path that continues to connect the neighborhoods along the 51-mile stretch of the river. The records given to UCLA Library document the efforts to monitor and improve the river’s water quality, create educational programs, promote sustainable water usage and develop bikeways and pedestrian paths, among other activities. Contents include rare photos of the one-off performance piece at the original Wallenboyd Theater — a performance that gave birth to FoLAR as an organization; the files of FoLAR’s Los Angeles County Drainage Area lawsuit that forced the Los Angeles County Department of Public Works to create the first L.A. River masterplan; and the records of FoLAR and its allies’ successful battle to turn a shuttered railyard between Chinatown and the L.A. River into a state park, which some have called the largest multi-ethnic, multi-cultural, multi-class coalition in the history of the city. Those materials, as well as more than a hundred boxes of additional files, newsletters, photographs and reports documenting FoLAR’s efforts to promote environmental awareness and community engagement, will be housed in UCLA Library Special Collections. The FoLAR records complement other UCLA Library Special Collections holdings about environmental issues such as conservation, restoration, environmental justice and toxic waste disposal. These include the Melvin Blevins Collection of Material about Water Resources in the San Fernando Valley, Dorothy Green Papers (Heal the Bay), Norris Hundley Papers, Richard Gordon Lillard Papers, Sierra Club Records (Los Angeles Chapter), Tree People Records, Unocal Corporation Records and the “Environmental Activism in Los Angeles” oral history series.